WOWTECH Vr Box Headset V3.0? 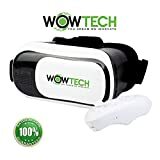 WowTech VR Headset fully supports Iphones & Android Phones ? New improved design. Made from highly durable ABS ,PC (Eco-Friendly) ? 43 sets of precision highly tested parts assembled and tested for extreme durability. ? Perfectly fit myopia users 600° ? Adjustable pupil distance and sight distance and Optical axis sliding control function: for personalizing fitting of each user. ? You can slightly adjust the position of the spherical resin lens through moving the button on the top of the 3d Vr glasses so as to get a better experience of watching movies. ? Achieve a viewing angle of between 95 to 100 degrees/FOV. ? Maximum screen size: 100° Bluetooth Controller ? Controls the movie you are watching or acts as a gaming pad ? Comfortable in your hand and easy to use ? Wireless Protocol: Bluetooth 3.0 compliant ? Usage time: Approximately 40-120 hours ? Maximum Distance: 10m ? Requires 2x AAA batteries (not provided) WOWTECH Vr Headset limited edition Storage Bag 35x47cm ? Color black ?high quality polyester material WOWTECH Vr Headset Bundle Contains ? Vr Box 3.0 Headset+Bluetooth Controller+ Headset Storage Bag+ Instruction Manual Once purchased we will send you link to download our EBook user guide.100% Satisfaction Guarantee, You will Love the WOWTECH VR Box Headset, We are sure of it! Supplies of this bundle containing the Storage bag are extremely limited. Hit the BUY NOW button. Do it soon, as I don't want to see you disappointed. We at WOWTECH are offering 100% no fuss, no quibble Money back 12 month warranty.